The Third Sector: Who's rattling the charity tin? This week we heard of the death of 92 year old Olive Cooke, who was hounded to death by a host of ghoulish charity fundraisers. Over a one month period Olive received 276 begging letters from charities as well as being bombarded by numerous calls every day from blood suckers, leeching the goodness out of the poor woman. After months of being hounded, she quite simply had enough and decided to throw herself off the Clifton Suspension Bridge. Last year citizens gave £10.6bn to charity, how much of that giving resulted from harassment and extortion is unknown. We do know that the Fundraising Standards Board received over 8000 complaints about charity extorters in 2013, that was a 50% increase over 2011. Now, those keen to show concern for the death of Olive are calling for tighter regulation of charity's fundraising activities. Don't hold your breath! There is only one solution to the charity problem, in the first instance, ban all charity begging, and longer term, phase out the very idea of charity giving and stop papering over the cracks of the social failure to provide adequately for citizens' needs. Few trust politicians anymore but they may trust a house-hold charity name like Age UK or Oxfam, or any one of the 160,000 plus charities operating across the UK. A 2010 survey found that 75 per cent of the public believes that most charities are ‘trustworthy and act in the public interest’. A different survey conducted a year earlier found that only 44 per cent trusted civil servants and just 13 per cent trusted politicians. Charities, voluntary groups, and NGOs are, in the parlance of our times, referred to as the Third Sector, and the third sector employs more than 600,000 people. This sector plays a key part in government policy, firstly, as a key player in Mr Cameron's Big Society project and vitally, as propagandist for various government schemes. The government says that most Remploy factories are losing money and should be closed because the money saved would be better spent assisting the disabled and employers in the mainstream workplace - a lot cheaper. Now, where we wonder do these ideas come from, yes, there is an idea embedded in there somewhere. Yes, the closures are about cuts but there's more to it. The idea is that disabled people would be better off in mainstream employment rather than segregated inside Remploy. Back in June 2011, Liz Sayce, chief executive at the disability rights charity Radar, suggested 35,000 more people could be helped into work for the same cost as supporting the 2,300 Remploy employees. She was carrying out a review into disability employment, commissioned by the Coalition. Reading her review, 'Getting in, staying in and getting on' , it would be hard to argue against Sayce's ambition to improve employment opportunities for the disabled. However, it would be hard not to see her ambitions as utopian, in circumstances of mass and rising unemployment. When the labour is shed from Remploy they'll wait a long time for their next job, if ever. The world beyond the Remploy gates has become an inhospitable place, people are talking the nation down, the mood is not good. In the case of Radar we have a charity writing a State commissioned review of sheltered workplaces, which the State would like to be rid of and the review it has commissioned supports the notion that this would be good for all concerned. Also over the past 15 years, the looser regulations surrounding charity lobbying has been accompanied by a very large increase in State funding for (some) charities. Between 1997 and 2005, the combined income of Britain’s charities nearly doubled, from £19.8 billion to £37.9 billion. 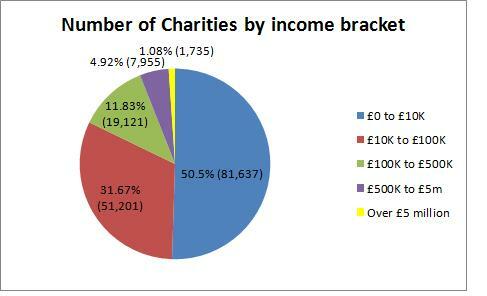 By 2010, charities received more money from government than they did from voluntary donations. Parts of the voluntary sector had in effect become not for profit businesses. The old idea of self-sacrificing volunteers and jumble sales was becoming a thing of the past. Communications, raising awareness and education became the new core functions of many charities, particular those receiving the bulk of their income from the State. For instance, The Child Poverty Action Group (CPAG) by the end of the New Labour period was receiving half a million pounds from State sources and only £76,000 from donations. Charities come in all shapes and sizes and motivations. Most charities, 75%, received nothing from the State directly, and some well known charities like the RNLI have no truck with State funding, and some like Keep Britain Tidy or Citizen's Advice are largely dependent on State funding but are not into political lobbying. Organisations like the Pedestrians Association, founded in 1929, when cars were killing 6000 people a year, is of a different type. Their good works included, pavements, speedometers in cars, driving licences and speed limits. In 2001, the PA changed its name to Living Streets and receives grants from Department of Health, the Department of Transport, the Scottish government and the National Lottery which account for half of its income today. Beyond selling its message, that it's better for children to walk to school, Living Streets spends its time promoting its anti-car message. Clearly, Living Streets is on message with government thinking. Stonewall, the gay rights campaigning charity, have an even longer list of State clients, including the Arts Council, Department for Trade and Industry, Department of Health, Home Office, Scottish government, Welsh Assembly, Greater London Authority and the Equality and Human Rights Commission. Most of these grants are restricted, typically for ‘education’, ‘research’ and ‘health policy’. Such charities are State funded pressure groups and their ultimate aim is to influence public opinion. Naturally, you might think, that's obvious, they are pursuing their causes but what if their ability to do so becomes mainly reliant on State funding. Do charities then become puppets of particular ideologies. Guidance from the Charity Commission states charities must only engage in political activity when it relates to furthering the goals of the organisation. The 1968 Health Services and Public Health Act, the Department of Health (DH) was permitted to issue Section 64 grants to voluntary organisations for the provision of health services which would otherwise be offered by the NHS. Initially, these grants incorporated the use of hospices, centres for the disabled and family planning clinics. However, over time some kind of 'creep' occurred and groups were included to promote a range of public health goals, especially those involving eating, drinking and smoking. The case of ASH, Action on Smoking and Health, is instructive. ASH was set up in the hope that it would raise £500.000 a year from donations, the money didn't appear, so ASH applied for and received a grant from the DH and by the 1990s, 90% of its funding was coming from the State. Alcohol Concern was set up with a £350,000 grant from the government. These organisations are part of a model of state-funded activism in contravention of the Charity Commission advice. The secure source of funding enabled these groups to become highly professional lobbyists, they had no popular mandate so they focused on networking, maneuvering behind the scenes. Eventually, the government yielded to their demands, demands that they were not opposed to in the first place but yielding made it look like they were giving in to the popular will - which only goes to show that Dave didn't invent cunning. This was the government lobbying itself. Until 2010 something called the Office for the Third Sector existed, this was rebranded under Dave as the Office for Civil Society. The Third Sector has been defined as "the place between State and private sector." Safe to assume then that it hasn't moved and that Civil Society is occupying the same space. Civil Society is the place where the will of the people is formed. Interesting to note then, that the role of many so-called charities are promoting themes that the people are not exactly inspired by, if not hostile to; for instance, Foreign aid, climate change, temperance, anti-smoking, ‘sustainable development’, radical feminism and support for the EU. You might suppose that the political elite, with its finger on the pulse of popular opinion through its incessant polling and focus groups would sense the public's ambivalence to numerous issues and set policy accordingly but what we actually see is a kind of subversion of public opinion through the use of voluntary organisations trumpeting phony causes paid for by the same public that do not support these causes. For instance, the Department for International Development has spent £50bn persuading the public that international aid is a good idea. Under Dave's Big Society project, Civil Society is supposed to be the place where local people are making the choices but in that space the locals are being bombarded by messages from agencies sponsored by the State, about how they should live and what they should believe. "Taxpayer-funded lobbying and propaganda on the rates weakens our democracy. So-called town hall newspapers are already closing down scrutiny from independent local papers. Now lobbyists are being used to sidestep transparency laws and shadowy figures are peddling more regulation and special favours." Our thanks to the Secretary of State for Communities and Local Government for raising the topic of special favours because taxpayer funded lobbying by charities weakens democracy even more so, not just in terms of the true expression of popular will but also in terms of squandering resources. Those charities chosen to promote State messages are commanding resources that would otherwise be used to produce goods and services that consumers value, spending billions of pounds selling ideas is nonsensical. These agencies may be described as rent seekers, i.e. they do not create wealth, they tap into the wealth that exists and through the privilege of State endowments, they take command of the resources and prevent their use in more productive areas. The word charity carries a halo effect, the term Civil Society conveys a notion of a private place out of reach of government and business. Charities operate within Civil Society, tapping into popular sentiment, addressing the excesses and disappointments of political and business decision making, campaigning for a better world. The halo effect and the perception of trust wears thin in circumstances where charities are no more than State sponsored message systems. Each year several thousand charities come and go, in 2011, 7,350 were removed from the register and 5590 signed on. Figures supplied by the Charities Commission show a similar picture of comings and goings in most years. 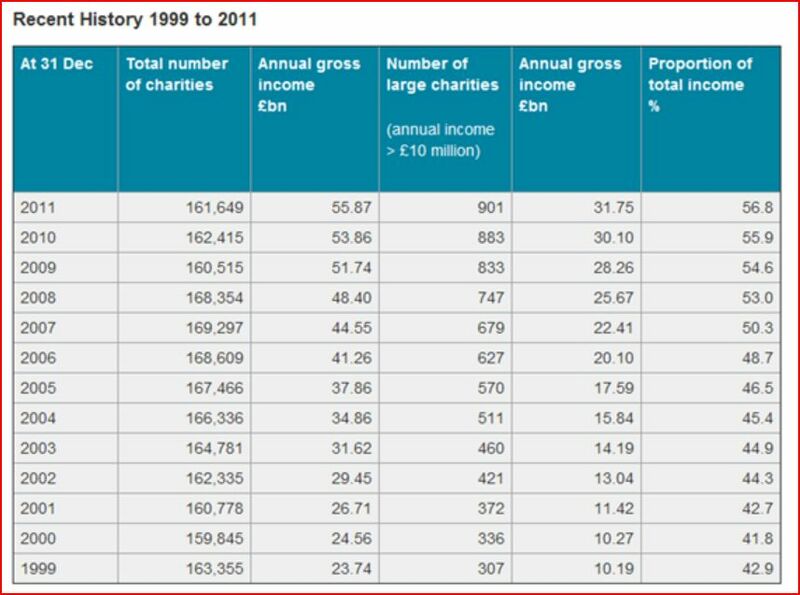 However, as the table below shows, the number of charities has declined in the past decade but not by a significant amount. A big decline can seen following the credit crunch but we see gross income increasing. How much of this increase was due to government propaganda spending; we can only wonder. That's the beauty of living in an open society, it's full of wonder. The press, specifically the Daily Mirror in this context, seemed to find the fact that over 7000 charities had disappeared cause for concern for Dave's Big Society. They thought that it signified a lack of willingness of people to support charitable good works, undermining the Big Society project. The net fall in registered charities was 1,760, we don't know how many of these were one-off fund raisers that had run their course and nolonger required; more to wonder about; reliance on partial surveys produce partial pictures. For instance, if a social enterprise, i.e. a business that performs a social purpose, e.g. helping prisoners on release, loses its funding due to local government cut backs, how can that be used as an example of the decline of charitable good works - as the Mirror claims. All such examples demonstrate is government reneging on its social responsibilities but then, that's the Tory project. The Big Society is about shifting responsibility and outsourcing the functions of local authorities. The Big Society project is as alive and well as Monty Python's Parrot but all those rattling the charity tins and clipping the coupons don't seem to mind. They call it the voluntary sector but charity bosses are not volunteers, some charity executives are being paid in excess of £200k and an elite few, in excess of £300k. The median pay level for the top 100 charities in the UK was £165,000 a year. Charity is big business, Sightsavers and the RSPB, for example, have revenue of £100m a year. "It is not for the Commission to tell charities how much they should pay their executives." Whatever happened to 'performance related pay'. Corporate services firm the Hogg Robinson Group and Save the Children both turn over around £341 million a year, but while the former pays its chief executive £594,000, Save the Children pays £165,000.